Apologies for such a long break between entries. Due to moving house, we’ve not had home internet for a long time, and it’s hard to squeeze everything in on my days with access to uni wifi or my mother’s internet. I intend to have more varied content here eventually, but in the meantime, here’s another post about supposed causes of insanity. 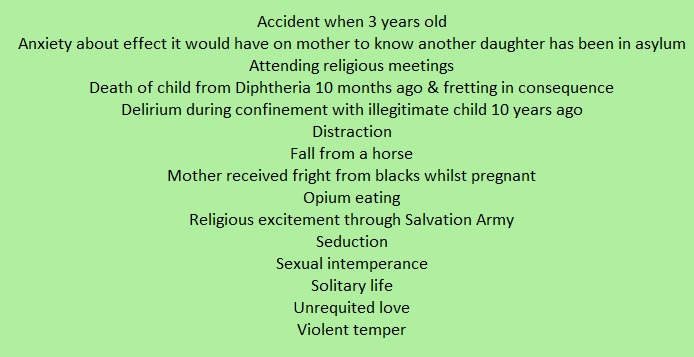 This group of causes was given on female records at Ararat Asylum between August 1884 and the end of 1889. During this period, causes are often labelled as being “predisposing” or “exciting”. The full list of supposed causes for this period can be found under the cut.